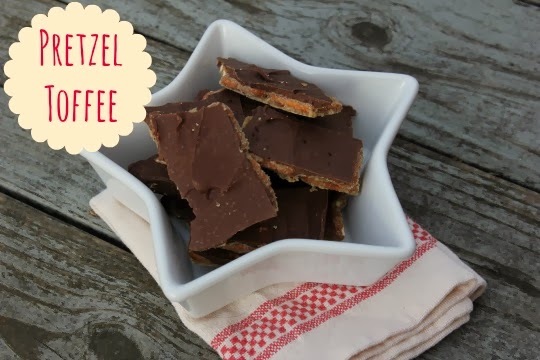 I've been making saltine toffee, for years, but I decided to change things up a bit and try it with pretzels. I will never go back to saltines again! Oh my gosh is this stuff good! Pretzel Snaps (the square waffle-looking pretzels) lined my baking sheet perfectly, but any pretzel should work fine. This stuff is SO addicting you better give some away immediately or you will eat the entire pan by yourself! Line a 9 x 13 inch baking sheet with non-stick aluminum foil. Cover the pan with a layer of pretzels. pour toffee over pretzels. Spread evenly with an off-set spatula. Bake in oven for 5 minutes. Remove from oven and pour chocolate chips over toffee. Let the chocolate chips sit minute to melt and then spread evenly over toffee. Once the toffee has cooled some, place it in the fridge or freezer for the chocolate to set faster. Break cooled toffee into pieces and enjoy!